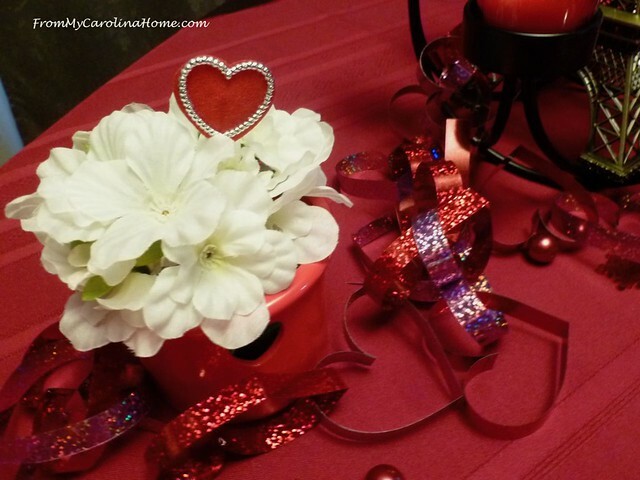 February brings thoughts of red hearts and romance, so it is time for a Valentine tablescape. 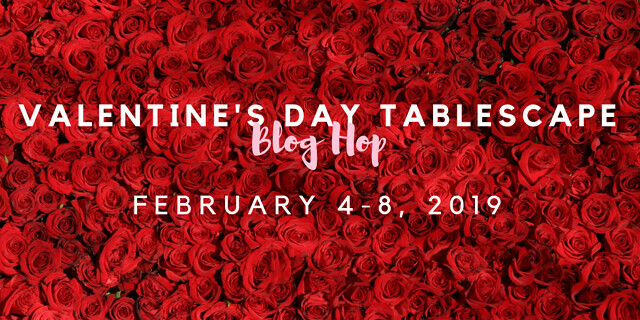 Once again this year, I’ll be linking up with a group of talented bloggers to bring you an array of ideas for your Valentine enjoyment in time to use the ideas in your own home. Last year my focus was on Japanese culture (Japanese Inspired February), and my tablescape was definitely Asian influenced – Aka Kuroguro tablescape. 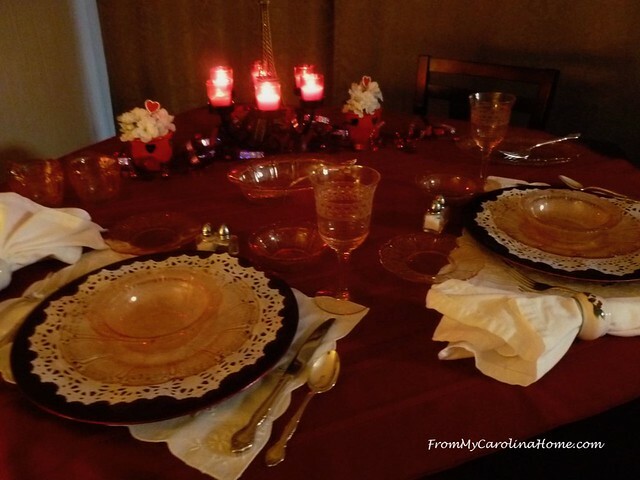 The previous year, I did my Valentine tablescape with a French wine theme in gold tones for a Romantic Table for Two. 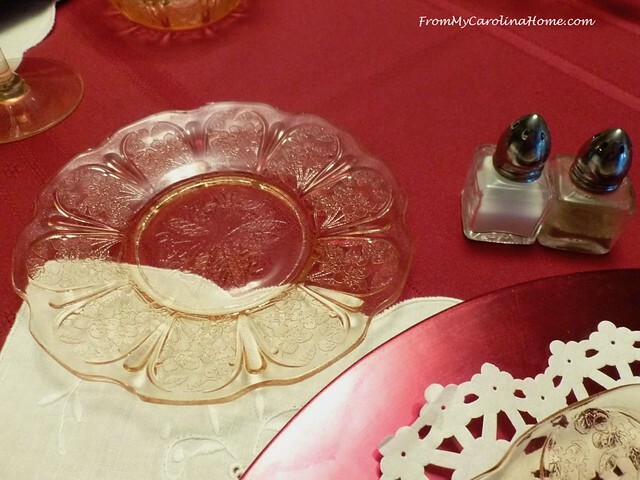 This year, I thought I would use my Pink Cherryblossom Depression Glass dishes for a tablescape. I’ve only used them once before on the blog, for a Valentine Breakfast featuring my Popovers with Black Cherry Creme. The challenge to myself this year was to use only what I already owned in a new way, no new trips to the thrift store. Well, at least not this week. The dish color is a muted pink. To bring the color out a bit, I began with a red tablecloth placed on point. White lace placemats are placed on top so the red chargers would show. The white lace paper doily serves to bring the setting together as well as showcase the pattern in the glass. I topped the plates with glass bowls in the same Cherryblossom pattern for the first course. Our nice silverplate flatware was added. The white napkins are held with white china rings featuring a cherry branch with cherries as a complement to the plates. On the right, a Cherryblossom fruit bowl and an etched pink wine glass are added to the place settings. It isn’t the same pattern as the dishes, and in fact is likely a bit older as it isn’t pressed. In the background, the vegetable serving bowl waits for a fresh side dish. A small bread plate is on the left and individual salt and pepper shakers are added. The centerpiece features an Eiffel Tower, which brings back memories of our time in Paris some years ago. I placed it in the center of a black iron base that holds six red glass votive candle holders with unscented candles. Heart garland is spread across the table, with some red pearls and tiny red snowflake scatter bits. I put some of the serving pieces of Cherryblossom Depression glass on the table, too. In the red holders with the cut out hearts, I placed silk flowers instead of candles, adding a little red heart pick. Let’s turn down the lights and light the candles, shall we? Very romantic, with the glow of the Eiffel Tower. All ready to enjoy a meal with my sweetheart. Now more fun! Come back all week as more links become active each day this week. Thanks to Chloe at Celebrate and Decorate for organizing this hop! This Valentine’s Day, we’re giving you 12 classes to own forever when you subscribe for a year. Offer ends 2/17/19. What a lovely, romantic setting. Just perfect for a meal with your honey! Carole, I love a vintage table, and your Depression glass makes my heart go pitter patter. It’s so wonderful to be able to have some matching pieces that old, they’re so fragile. The coordinating stems are perfect. Love the candle glow, it elevates the special feeling of a romantic table, and to have been able to actually go to Paris makes that Eiffel tower that much more special. I can imagine the conversation of recalling fun times spent while enjoying the present moments at your table. Your table is so pretty. 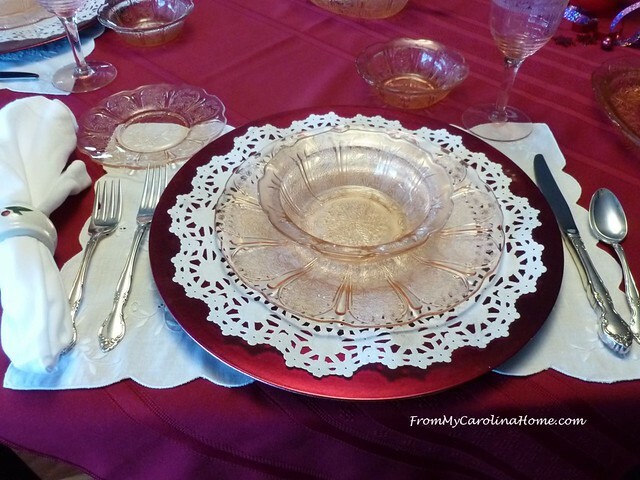 Love the lace doilies under the pink depression glass. 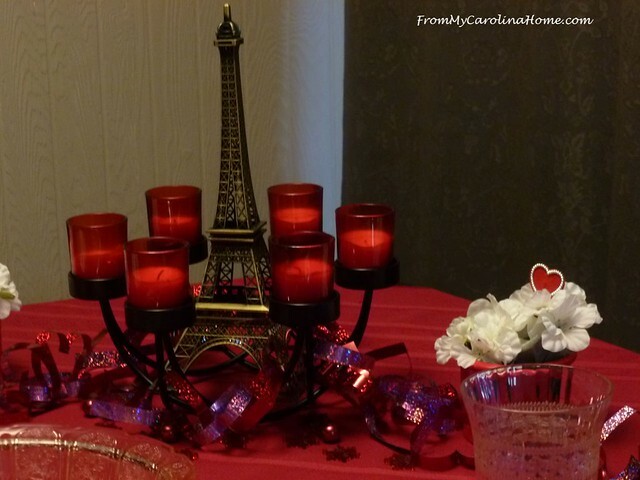 The Eiffel Tower is always a favorite of mine to tie in romance with Valentine’s Day and I used it for my tablescape too. The romantic glow of candles and flowers can’t be beat! Carole, I really enjoyed viewing your table with so much vintage charm; especially your depression glass dishes and pink etched glassware. What finds! My table on Wednesday has an Eiffel Tower theme so I really enjoyed seeing how you styled the romantic centerpiece. Your tablescapes are always gorgeous. I especially love that mini Eiffel Tower. Beautiful! Beautiful! Your depression glass is gorgeous! And the romantic glow… nice. Carole, I find your table and post very interesting because I know nothing about depression glass. I walk into an antique store and I have no clue what I am looking at, so when you describe your beautiful glassware I get a much better sense of how to appreciate it. Love the photo of the Eiffel Tower glowing in the candlelight. Carole, I am in love of depression glass and have it in the green cameo, pink cabbage rose and yellow Florentine and blue bubble glass….I can’t get enough of it as I have collected it for years and years. I so appreciate your Cherry blossom pieces and your table is beautiful. The Eiffel Tower is perfect and the candlelight photos are so romantic. It is always a pleasure to blog hop with you. Romance is in the air at your table, Carole. The Eiffel Tower and Depression glass brings a feeling of cozy intimacy and forever courtship. Lace and candlelight is such a heartwarming touch to a table already beaming with love. Hello Carole, Oh, your table setting is so beautiful! I do believe that one of my Grandmothers had some of your dishes. They truly are very pretty. Using the ideas, like the red table cloth to help bring out their color was a wonderful. The delicate white lace doilies were another fine detail that does enhance. Your napkin rings are lovely. I absolutely love the Eiffel Tower and how you put the candles around it. Plus, when you turn off the lights and light the candles; it is a very romantic beautiful setting you have created! 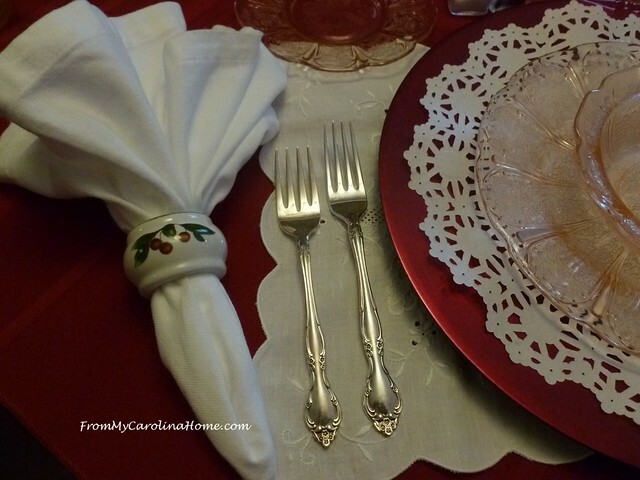 Thank you for sharing this special table setting with us, Carole and have a fabulous day! Very romantic indeed! The depression era dishes add so much to the ambiance and harkens back to simpler times, very refreshing in today’s world. The Eiffel Tower centerpiece is so pretty! Gorgeous. Everything looks so beautiful. 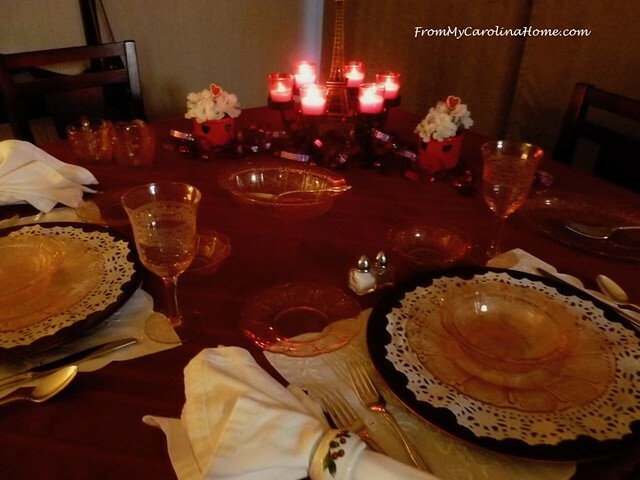 Carole, I love your romantic table set with your beautiful depression glass. The etched stemware is stunning. I always think of Paris and the Eiffel Tower as being romantic. We also have fond memories of a couple of trips to Paris. It is always a pleasure to blog hop with you! One more thought, the difference between and meal and a snack is the candlelight. Beautiful table settings. I love seeing what you do each season. How lovely your centerpiece of the Eiffel tower is, especially when lit by the candles! 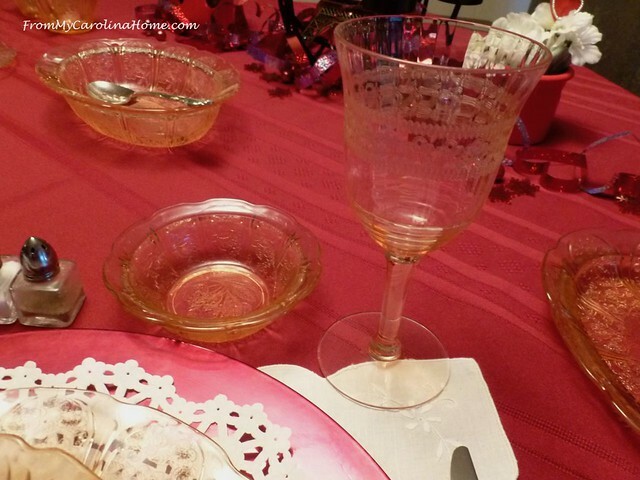 I love seeing the use of the delicate depression glass, something I have a little bit of, but the color and pattern of yours is perfect for a Valentine’s table! Thank you so much for once again joining us in another tablescape blog hop and sharing your styling talents! Wow, the depression glass is so pretty. The Eiffel tower scream romance and Paris. Candlelights is so romantic. A pleasure joining you on this Valentine blog hop. This is so pretty Carole. You have such treasures to use and share with us. Carole, I love the french theme. The pink glassware dishes are lovely and such a treasure to have and use. Love the idea of the Eiffel Tower and candles. 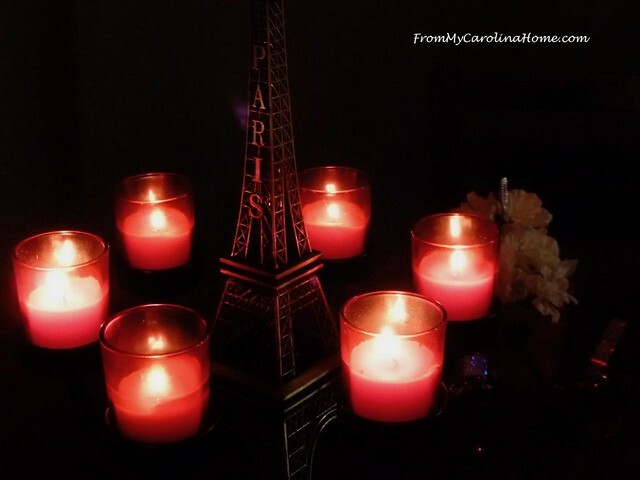 Carole, your photo of the Eiffel Tower aglow with candlelight is gorgeous! I too admire your depression glass. I have a set in the pink dogwood pattern that I inherited from my great aunt. They’re so dainty and elegant…just right for this holiday. Have a happy Valentines Day! So pretty, Carole! I love the Eiffel tower! Carole, this table is so, so pretty, and perfect for a romantic dinner. 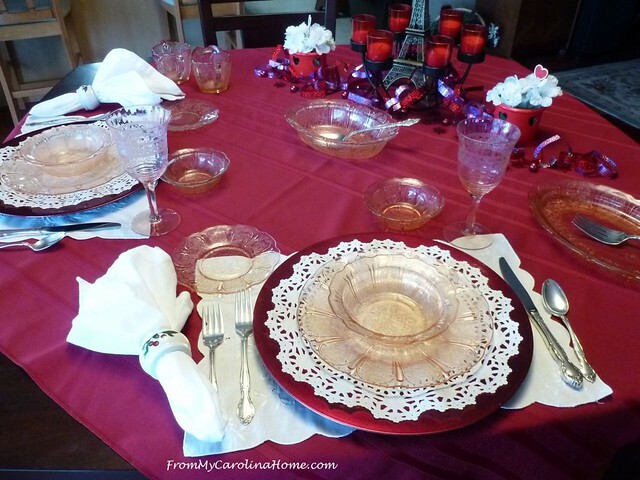 I adore pink depression glass and those pretty lace placemats showcase it beautifully. It has been so much fun being on this hop with you. Happy Valentine’s Day!!! Nothing says romance like Paris! It especially looks gorgeous with the candlelight! I have two of hose little pink dishes that belonged to my grandmother and didn’t know the pattern was Cherry Blossom! I will have to look for more pieces now that I know what I am looking for! This is so pretty! I love your Cherry Blossom depression glass and how your centerpiece brings back memories of a special trip. How romantic! Happy Valentine’s Day! A romantic dinner in Paris… what else? Bravo! My napkin rings are by Cades Cove, and have apples on the other side. It is very similar to Orchard Ware. 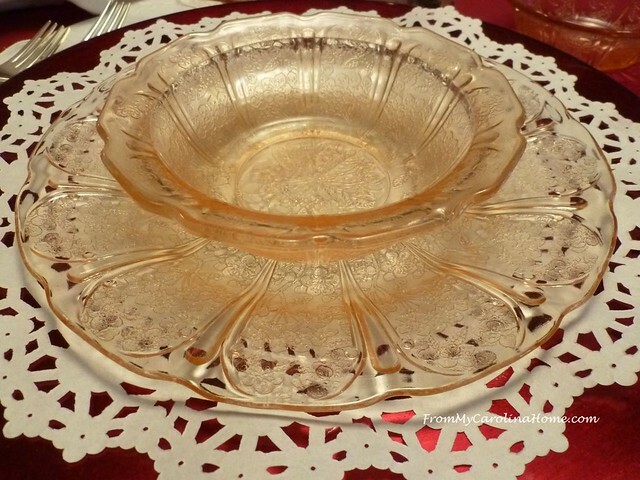 Your depression glass is GORGEOUS, Carole! There is nothing more romantic than dinner with a view of the Eiffel Tower. 😉 So fun hopping with you! Happy Valentine’s Day to you and your honey! Such a pretty tablescape using what you already had! 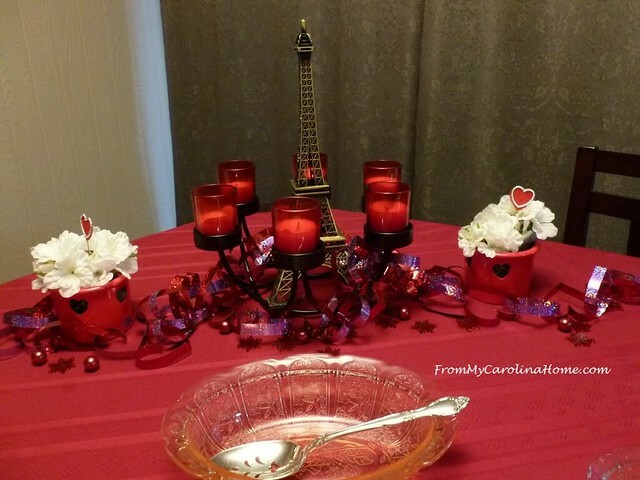 I love the Cherry blossom Depression glass, and the Eiffel tower is perfect Valentine touch. Everything looks so perfectly romantic in the candlelight too! So happy to join the hop with you! Have a Happy Valentine’s Day!